Arriving at Saddlewood townhomes for sale for the first time would be a series of discoveries. First you’d drive through downtown Breckenridge, around toward the Riverwalk, then head up toward the ski mountain on a road flanked by condos until you reach the Snowflake Lift - carrying lots of skiers uphill in the winter. You’d make a couple of turns around big, new ski lodges, and then enter a neighborhood, and slip onto a little lane. There you'd find Saddlewood Townhomes for sale scattered around it. Out in the backyard, you’d notice the swarming skiers queuing up for the lift. Find out more about these exclusive townhomes, or browse the Saddlewood townhouse listings found below. 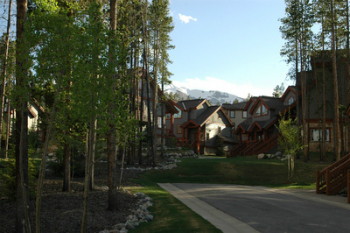 Late nineteen nineties construction in Breckenridge took a turn toward Mining-Era Revival, which shows up in Saddlewood Condos as board and batten exterior accents, a mix of vertical and horizontal siding, gable-covered entrances with rough timber columns and hewn-timber trim. They also retain some features of the Third Wave Condo architecture, popular earlier in the decade, with big, stacked windows, crowned with triangular ones that form a slight clearstory, and vaulted living space inside. The Snowflake Run is in the backyard of Saddlewood Townhomes – it’s truly ski-in and ski-out. Not far to the south is Beaver Run and another major chairlift to the top of the mountain. 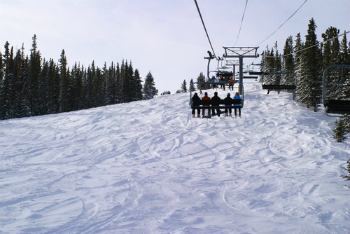 The ski resort is built on national forest, so in the summer there are trails and wildlife where there were skier and ski runs in the winter, and downtown Breckenridge is a short walk downhill. The free bus system stops at the Snowflake Lift and makes the walk back home a little easier. Size: (1) 808 sq. ft., 1748 sq. ft. to 2183 sq. ft.
From the traffic circle on the north side of Breckenridge continue on Park Avenue for 1.5 miles to Four O’clock Road, turn right, and just before the base of the Snowflake Lift, turn left on Kings Crown, turn right on Illif Ct. for some units, or continue on Westridge, then quick right on Snowflake, and into Bluff Court. To ski out, open the backdoor and head north. Contact us if you would like to discuss your real estate opportunities in Saddlewood, or any other Breckenridge, CO area.